Your refrigerator is one of the most important and used appliances in your house. It is where you keep your food. As this is where you put the very stuff that you put inside you everyday, it is given that your refrigerator should be clean and organized. However, as you may have noticed, either from your own refrigerator or from television shows, the inside of your refrigerator is more often than not the one of the most disorganized places at your home, maybe even worse than your closet. So for your sake, and for your visitor’s sake, organize your fridge by following these steps. Step 1: Assess your food. As the fridge is where you store the food that you will eat or that you have eaten, the refrigerator may be a place where foods from the bygone era reside. It is not surprising to find expired food in your refrigerator; it is important to throw them out, for your own health’s sake, of course. You can keep track of the quality of the foods in your refrigerator by labeling food or by keeping track of their labels. Remember: Keeping expired or spoiled food out of your refrigerator may not just give you precious space, it will also help the other foods stay fresh as they won’t be affected by the spoiled ones. Using special containers can help a lot in saving precious spaces. They will also seal the food to keep them fresh and retain their original qualities for long. Remember: As long as possible, try to purchase see-through containers so you can easily identify the food from the outside. Also, try to purchase plastic containers as they are more durable than the fragile ones. Step 3: Arrange them according to type. 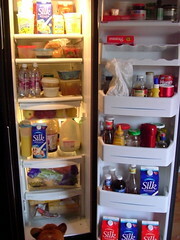 Arranging the food according to kind or category is the most evident way to organize your refrigerator. This will make it possible for you to wisely use the space in your refrigerator. Remember: Arranging the food in your refrigerator by kind or category will not only give you an organized refrigerator, it will also help you to get things from your refrigerator faster as you will already know where to get them. Organizing your refrigerator may take quite a lot of effort and time from you, but the results will of course be great. Not only will it keep your food fresher, but it will also keep them fresh and more delicious. Organize Bake Sale – All about food and food-related activities. Cooking Tips – Related to cooking and food stuff. Cleaning Your Refrigerator – Cleaning and organizing your refrigerator. Setting Table – Organizing and setting up kitchen equipment and furniture. Post-party Clean-up – All about food and food-related activities. Closet Organization – On how to organize everything on your closet. Organizing Catch-all Closet – Organizing your closet or cabinet to have more space. Closet-space Saving Ideas – On how to organize things and furniture at home. Refrigerator is one of the most important appliances in your kitchen as it serves as a storage for your vegetables, water, fish and meat. It adds to the storage life of your food and will keep it away from deterioration and bad odor. But sometimes we tend to ignore the importance of organizing all the food we store from wet to dry and fish to meat. We should keep in mind the importance of organizing our own refrigerator to avoid bad odors and slime. Lets start from identifying all the items we store, its storage life span before deterioration, sort from wet to dry items and put a label at its plastic or storage container the expiry date of an item. Every homeowner should be wary of their refrigerator’s cleanliness because it is where they store their food and beverages. A messy refrigerator would possibly mean that the food inside could be contaminated or prone to spoilage. Basic cleaning tips like wiping up spoils inside will prevent foul smell and molds to appear. Food (especially left-overs) should have the proper storage (preferably closed containers) and grocery bought foods should be properly closed and covered. Arrange the items inside (like eggs should be safe from breaking and milk bottles should be standing up instead of being put horizontally). The items should also be placed considering it’s temperature (what should be in the freezer, etc). Lastly, avoid smells by putting baking soda (open box) inside or putting orange peels. My Mom always told me that the best way to organize your Refrigerator is before you even buy it. That is because, before buying, you should carefully assess its size and capacity according to your needs. Does it have enough space? Does it have proper compartments? All of these are factors once you in organizing your refrigerators. And Items that are not required to be put inside should be kept outside to provide space for other items. And also, to prevent bad odor or smell from developing inside your fridge, try to put some charcoal inside. By putting charcoal, the undesirable scents are soaked up by it, thanks to its porous property. A refrigerator is one of our basic appliances or things that we should invest within our household. It is important that we should use it properly and get in the habit of cleaning it since it is where we keep and store the majority of the food that we eat. Always keep in mind that every food item that we keep in our refrigerator has it’s own storage place. It’s also best to use containers to save space and to avoid leakage of smell from one food to another. And when you clean your refrigerator discard those that expired and left overs that cannot be eaten already as to avoid food poisoning. I think cleaning atleast once a week is the best way to check the freshness of all the food stored. This is for us to have a healthy living. It is important in our family to always stock our refrigerator for fresh fruits and vegetables because we have little kids at home and we do not want anyone to be sick. What we do is that we put a piece of paper in our refrigerator to remind us when we bought the perishable goods and how long we can only store them. That way, even if we are busy, anyone of us can just take a look at the list and throw stale/bad food items themselves. The best way to organize your fridge is by not buying too much food that you cannot consume in a week. Foods that you cannot eat right away will most likely be stored in the fridge. So buy only those that you intend to consume within the week. It will not only keep your fridge free of space but will also keep the freshness of the food you buy. To save more space, read the labels. Some food can be stored at room temperature; meaning they don’t need to be kept inside the fridge. Cleaning your fridge at least once a week will help you with the inventory of the food available as well as help you find those stale food hidden at the back that you have already forgotten.